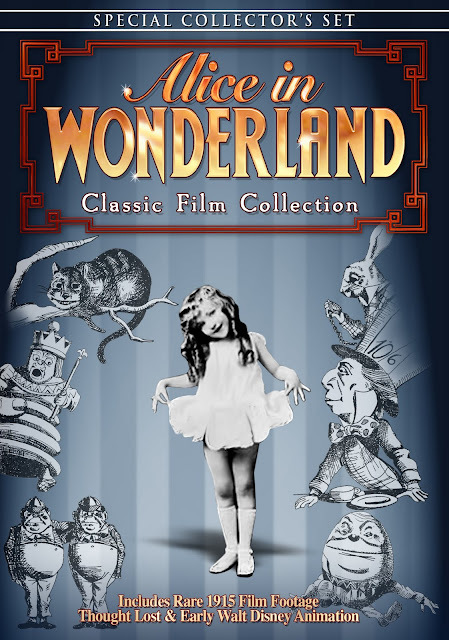 Discussions Magazine Music Blog: ALICE IN WONDERLAND Classic Film Collection DVD! ALICE IN WONDERLAND Classic Film Collection DVD! Lewis Carroll's whimsical 1865 novel, Alice's Adventures in Wonderland, was a cinematic favorite long before Johnny Depp 'went Mad' The first film (just eight minutes) was produced in 1903. With dozens of versions since for stage, film and TV, its beloved characters have been played by some of Hollywood s most legendary actors. Alice in Wonderland (1915) The first version near to the novel, this silent movie starred Viola Savoy. Though many believe the film to be lost in its entirety, includes all 52 minutes. Produced long before CGI, the creatures are costumed actors and the absence of dialogue creates a surreal, dreamlike quality. Also stars Elmo Lincoln, who went on to fame as the original Tarzan. Alice of Wonderland in Paris (1966) This enchanting feature film with French animation includes the voice of Carl Reiner. Alice's Adventures in Wonderland (1972) This British musical feature film adaptation features a star-studded cast, including Michael Crawford, Peter Sellers, Dudley Moore and Fiona Fullerton.